The energy security platform was formed in October 2011 in attendance of public administration bodies and municipalities within the Economy Committee of the parliament of the Czech Republic. It is a unique PPP project in the Czech republic. TPEB CR founding members are on one side private leading energy companies, companies administrating energy distributing networks, energy lines, mobile phone operators, software and communication companies, leading research centres. On the other side public sector represented by representatives of establishment, namely Ministry of Interior and Ministry of Industry and Trade, universities and top experts as well as companies focusing on security, both cybernetic and physical, including companies providing security guard services for both building and physical persons. At present membership is growing and intensive cooperation with all entities for which the membership or services of technological platform may be an asset is starting to be established. TPEB CR defines, represents, speaks in support and advocates legitimate and joint interest of its members in the area of research, development and application of modern technologies increasing level of energy and cybernetics security. TPEB CR contributes to mutual coordination of activities and awareness of public administration bodies, research and development entities and security technology suppliers. 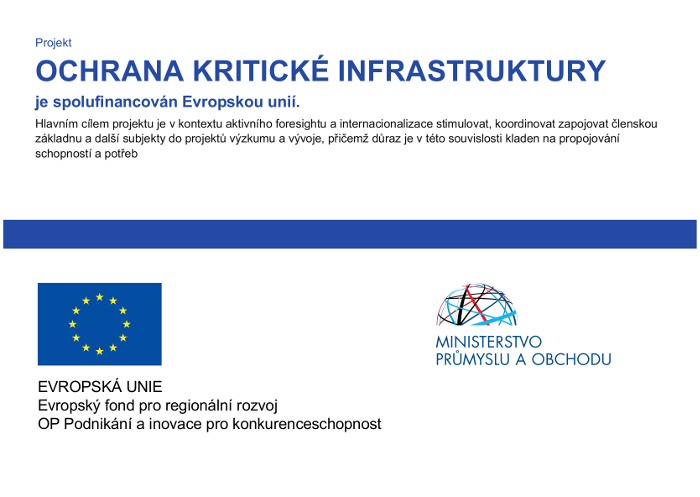 These activities are carried out in connection with both EU and CR programs, related financial and as well legal regulation of CR and EU. Direct participation and options for joint enforcement of particular technological-, standard-setting- and legislative matters in the EC advisory bodies. A cyber Act was already accepted in the Czech Republicl. This is associated with a number of implementing rules and regulations impacting the operation of institutions and companies. In cooperation with the Ministry of Industry and Trade (Czech Office for Standards, Metrology and Testing), the TP may, upon request, initiate establishment of a Special Working Group on certain issues within the scope of the EC organizations. A company, respectively its experts may pose as the process leaders. Utilizing direct communication (formal as well as operational) between the TP and the Ministry of Industry and Trade of the Czech Republic—”Task Force” for making comments and suggestions in the area the TP covers The same applies to its relationship with the Ministry of Interior where the same mode has been established. Based on the requirements and needs, the TP will mediate communication with EC bodies and institutions or with particular prominent representatives of these institutions.